Let’s get one thing about of the way first, Justin Kurzel’s 2015 adaption of Macbeth is easily one of the most beautiful looking films ever made. From the very first scene the landscape draws you in and never lets you go. The problems add up once people actually start talking. This really isn’t the fault of the source material since it has been around for hundreds of years and still holds up, it comes down to pacing. The pacing of the movie is so slow at points it is hard not to doze off. 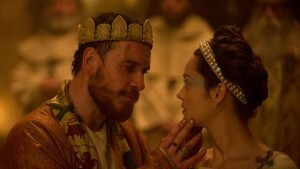 Michael Fassbender and Marion Cotillard bring intensity to the newest adaptation of Macbeth. This comes in utter contrast to the beauty that surrounds the film and intensity each of the stars brings to their roles. Michael Fassbender is a powerhouse as Macbeth, playing it with passion and subtlety. Watching him slowly go insane is worth the price of admission, he needs to be able to let loose in more films. The same can be said for his nemesis Macduff, played brilliantly by Sean Harris. Each man is torn apart by the path they have chosen and their loyalties to the point of utter destruction. This battle rages on in the highlands of medieval Scotland, a place where everyone feels the consequences of battle. Cinematographer Adam Arkpaw lets the landscape breathe and take on a life of its own in a way most Shakespeare films would rather forget. This approach makes the film a breathtaking experience that must be seen on the big screen. The final fight between Macbeth and Macduff is almost apocalyptic yet comes across as pure, natural beauty. If only it moved just a little bit faster, this would be a quintessential Shakespeare film. Unfortunately its inability to move things along means the film gets in its own way far too much. Granted, this was originally meant as a play without any camera movement, but in the modern era it is totally acceptable to change perspective when the story demands it. Far too often the camera remains still and lifeless taking the momentum out of what could have been powerful scenes. Regardless, the film itself is daring and brutal in a way other adaptations have not been, for that it should be commended. Macbeth opens for a limited run on December 4, 2015.